Learn tattoo makeup techniques from A-to-Z with Academy Award-winning tattoo effects innovator, Christien Tinsley (American Horror Story, I Am Legend, No Country for Old Men). 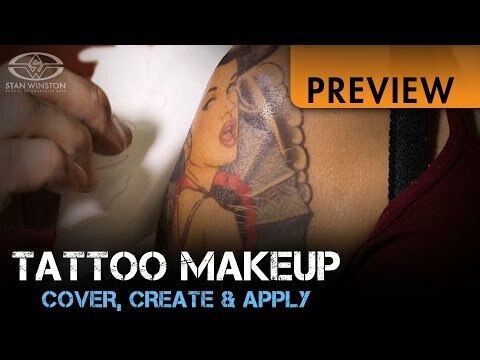 Tinsley shares everything you ever wanted to know about body illustration for film, television, and theater, from covering real tattoos and creating a custom fake tattoo, all the way to final application and removal. i,m a make -up artist from Malaysia , we have difficultly for getting some of the product you mention in your course . i have a low budget movie coming up which need body tattoo makeup but this time is a very complicated design . i have done some tattoo using airbrush but this time the design is too small and require of a lot of blending and i,m not sure i,m good in it . 1. from this class i understand your company provided service to print the design we wanted by using your transfer paper. we need 6 set of this transfer paper for a small size female cast and the design is from shoulder to the hips full tattoo at the back . 2. if we can't afford of getting your service . any advise on this issue ? 3. is this transfer paper Inc is save to use on body ? the Inc is attach with this thin transfer paper that looking visible from camera ? 5. we are shooting in 3 or 4 day in a roll to save time and cost. can we use up to 2 day or 3 day ? 7. can i have your company name and website .